Government shutdown and debt ceiling: Senate talks deadlocked over spending. Update: There was a bit of optimism in the Sunday talk shows from senators who said that talks between Senate Majority Leader Harry Reid and Senate Minority Leader Mitch McConnell were a good sign that something could be resolved soon to end the government shutdown and avoid a U.S. debt default. “It’s taken far too long. We never should be in this situation,” Sen. Susan Collins told CNN. “But I do believe there’s going to be a resolution this week.” Sen. Charles Schumer told CBS News he’s “cautiously hopeful.” But Reid and McConnell were still at an impasse earl Sunday afternoon, according to Politico. The two main sticking points? Government funding levels and the length of the debt ceiling increase. “If you break the spending caps, you’re not going to get any Republicans in the Senate,” Sen. Lindsey Graham said on ABC News. But what about Obamacare? Isn’t that what the whole shutdown was about anyway? Seems Republicans have recognized that’s a losing battle. Graham acknowledged that delaying or defunding Obamacare was “not a realistic possibility now.” Indeed, Graham suggests Republicans would have been able to more effectively speak up against Obamacare if the government shutdown hadn’t happened at all. “What breaks my heart is for the last 12 days, you have had a complete meltdown of the portal called Obamacare; the whole system is just not working. And we’re overshadowing how badly Obamacare has been rolled out,” he said, according to NBC News. Update, Oct. 12 at 4:30 p.m.: Looks like it’s up to Senate Majority Leader Harry Reid and Senate Minority Leader Mitch McConnell now. The two leaders launched a new series of talks to re-open the federal government and avoid a U.S. default. “The fact that the two leaders have taken over negotiations suggests an intensifying desire in both parties to end the fiscal impasse,” notes the Washington Post. But that doesn’t mean they’re close to an agreement. “We haven’t done anything yet” to bring the two sides closer together, Reid said. Optimism earlier in the day that a plan led by Sen. Susan Collins of Maine could lead to an agreement were dashed when Democrats rejected the plan. Still, Collins said her plan could serve as a blueprint for a bipartisan deal. 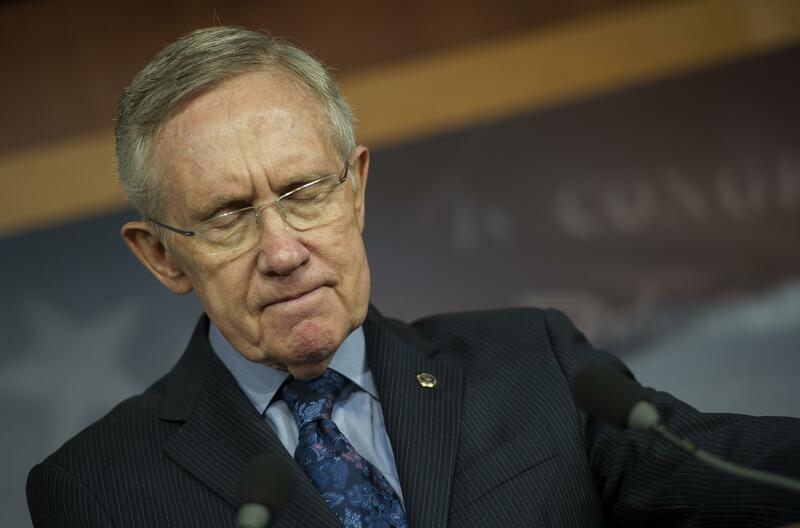 Reid said Democrats should not have to make concessions on Obamacare. They also rejected the length of the debt-limit increase saying it should last longer than January 31, notes USA Today. Most importantly though, Republicans want to keep automatic spending cuts known as the sequester in place. McConnell, however, was eager to defend the sequester, saying Republicans will not compromise on that unless there are equivalent cuts in entitlement programs. Still, the Senate leaders said they’re concerned about how the market could react Monday if there is no deal over the weekend, reports the Wall Street Journal. For now, House Republicans acknowledged “they had temporarily been reduced to virtual bystander status,” points out the Associated Press. Some Republican lawmakers were quick to say they still want any agreement to contain Obamacare concessions. Still, some Democrats expressed hope the House GOP would eventually go along with a Senate plan, assuming one emerges, of course. Now, on the 12th day of the shutdown, all eyes turn to the Senate, where a plan is in the works that could open the government and raise the debt limit. Three Senate Republicans led by Sen. Susan Collins of Maine are spearheading the proposal that would delay the medical device tax for two years and create a provision to make sure only those eligible receive subsidies in the insurance exchanges, reports the Hill. To make up for the lost revenue, the proposal would change the way pensions are calculated, notes Politico. The deal would extend government funding for six months at the current leveland raise the debt ceiling until January 31, according to Reuters. Although there seemed to be a light at the end of the tunnel on Friday that a deal might be reached this weekend, that now seems unlikely. When House members were told there would be no votes over the weekend, many decided to head to their home districts. “I was optimistic yesterday morning,” a lobbyist told Reuters on Saturday. “I’m a little less optimistic today and so are folks I’ve talked to” on Capitol Hill.